Like many prospective college students we work with, Erin had a firm idea about the college she wanted to attend. She believed she had found her “dream school” when she submitted her seat deposit to Wake Forest University during her senior year of high school. But that all changed when Erin had a conversation with her parents about the financial implications of her decision to attend the private North Carolina university. Her parents were requiring she take a 50% stake in her college education, regardless of where she went. Erin wasn’t receiving any financial aid or scholarships from Wake Forest, and with her parents only willing to pay for half of the full $160,000 tuition bill, she would have to come up with $80,000. As a prospective journalism and theater double-major, Erin knew that finding a high-paying job to pay off that debt quickly would be nearly impossible. So when Erin’s father presented her with an alternative to her top-choice college, she began to reconsider her decision. 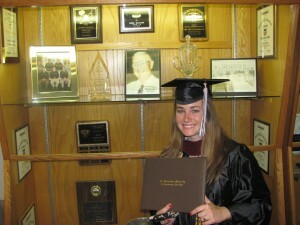 Erin’s father proposed that she instead attend St. Bonaventure University, a small Catholic school in Western New York. The school was offering her a 50% merit scholarship, the magic number her parents required she pay, meaning she could graduate completely debt free. Erin had only originally applied to St. Bonaventure because of her strong family legacy with the University. But by sitting down and analyzing the consequences of her college decision, she realized it made much more financial sense to attend St. Bonaventure. The decision where to attend college is an emotional and personal one. But when finances are limited, or when parents require their children to take financial responsibility for their education, like in Erin’s case, it’s important not to let emotions get in the way of sound judgment. Erin was thinking about her future when she decided to let go of her dream school. People tell her she’s “lucky” that she doesn’t have to make a monthly student loan payment, but she wasn’t lucky–she was smart. Erin holding her diploma from St. Bonaventure. Photo courtesy of Broke Millennial. Of course, cost is not the only factor to consider when choosing a college. But most families do not have the means to ignore it completely. When deciding which college to attend, it’s essential to carefully evaluate financial aid packages and make sure you fully understand the responsibility of taking out student loans. And, if possible, try not to get so hung up on one school. There are hundreds of colleges out there you probably never considered–and one of them might also be “perfect” for you too while costing a lot less and leaving you with much more future financial freedom. Check out Erin’s full story on her Broke Millennial blog, and feel free to reach out to us if you need help with the financial aspect of your college decision.